It’s 2006, there’s so many people crowded around you, and then the music starts. The lights turn on and face the curtain as Jay Leno of The Tonight Show comes out on his stage, shaking everyone’s hand in the front row, but you’re in the third. Oh heck, you stand up and rush to the front like you belong there anyways and you’re the last person Jay Leno shakes hands with. His hands are clammy. His main guest of the evening is Kate Beckinsale promoting her new movie with Adam Sandler, Click, which has something to do with a magical universal remote control. That, by the way, was a snippet of my real high school graduation vacation. So much fun. The concept of this film is actually pretty unique. 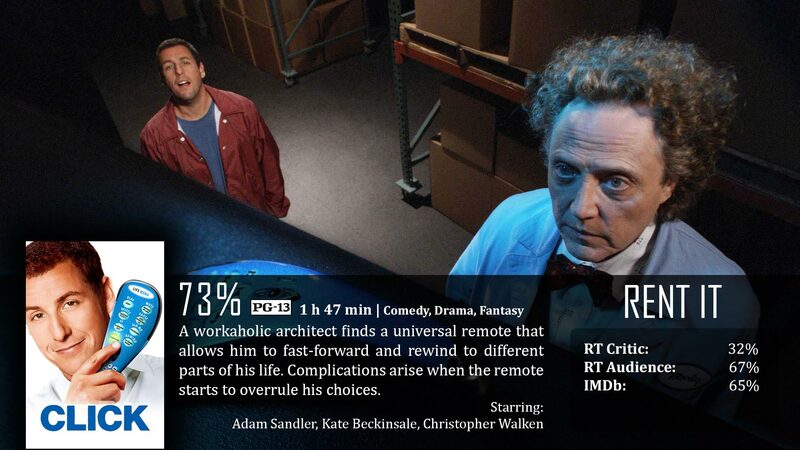 It’s about a guy named Michael Newman (Sandler) who is a bit of a workaholic. He loves his family, but work and success slightly take precedence. When he goes out to buy a “universal remote control” for his TV, he goes to Bed Bath & Beyond – specifically the “Beyond” portion where a weird dude named Morty gives him a new remote control that isn’t on the market yet that lets him control the universe around him. Fast forward through an argument, skip sickness, mute annoying people, and of course pause time. He can also use the rewind button to view moments in his life that have already happened. It’s quite the unique toy. The problem is, it has auto-settings that are fine-tuned to the user’s life preferences, and suddenly…bad thing after bad thing keeps happening and there’s no seemingly way to stop it. This is clearly not the best performance by Adam Sandler, but to be honest there are some great heartwarming scenes that might surprise you. People might think that the genre of this film is a bit of a flippity-floppity type, and that may be true, but I’m perfectly okay with that. It goes through the motions of, “hey, this is a really cool device. It’s practically a magic wand” to “be careful what you wish for…seriously”. I think it works as far as tone goes. Then again, the light, comedic tones, aren’t always that funny. In fact, a lot of the jokes were cheap gags that will most likely not impress. Some work, but for the most part…I don’t think the comedy is why you watch the film. You watch it for the concept, as I’ve mentioned above, and for the messages. The concept is honestly very good and I’m pretty impressed that they haven’t made any Hollywood sequels based solely on the character of Morty and the universal remote control. I think there is a lot of potential there that could be used in other films, but I digress. The concept is fun, but the messages are really important when it comes to the importance of family coming first, and living each day like it is your last. Menial tasks may always be annoying, but if you never had them, you might find yourself missing them. Carpe diem, my good folks, carpe diem. People hate Adam Sandler, and I can understand why, what with all of his similar roles in film, but I wouldn’t exactly compare this role to his others. Sure, he’s a bit immature here and there, but there are like, maybe five of his films that are honestly really good – as far as his performance goes, and I have to say Click deserves to be in that specific circle. No, it’s not his best, but it gives you a glimpse of what he is capable of, and I don’t take that very lightly. I do remember liking this film more the first time I saw it. Maybe because the mystery is gone, I don’t know, but still – it translates as well now as it did eight years ago. The concept of Click is still pretty fresh, and the messages of family importance and living life to the fullest are very strong and commendable. Sandler also puts his best foot forward in terms of acting ability. Not his best, but still pretty good. Some people have complained about this film feeling cluttered in terms of genre and believability. It starts off very modern. The only fantasy item is the remote control itself, then as it moves forward, you get more and more into sci-fi territory, which feels a little weird for some reason, like it’s not entirely needed to go that route. It also mixed a lot of comedy with emotional drama, which feels uneven to some, but I do think it was well done. So there’s that. Ammer: Anyway, the sooner you ge – Get back to – Uh, work, the sooner you’ll be partnerized. I taste sh**. Wow, you shook hands with Jay Leno! Sorry Dave I was just blown away by that first paragraph! 🙂 Haven’t actually seen Click – I’ve often been curious about it but always ended up watching something else instead. Adam Sandler has done a lot of weird stuff (Eight Crazy Nights, Jack and Jill) but this holds up as one of the craziest movies he did because it started out as a comedy and out of nowhere, it becomes a depressing drama. It was weird and the abrupt change makes this one of my least favorite Sandler movies.